Are you the independent type? The kind who can do it all by herself? Or are you the girl-in-need most of the time? There are some women who prefer to do everything for their spouse or partners in life. Sometimes, it's almost like the husband dictates every little thing that she can or cannot do. I think it is good to be a little independent at times. It's good to be able to make some of the rules that the men should obey, too. I do like it when i am able to accomplish most of the things that my fiance needs or expects me to do. 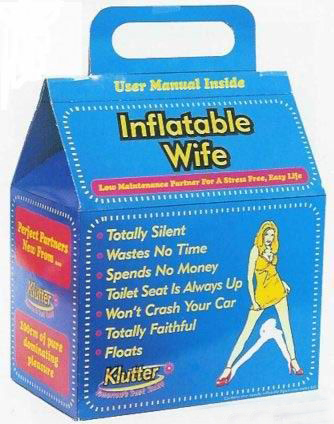 But I also still expect the relationship to be a two-way thing, that is, I can be an "inflatable wife", as long as he's an "inflatable husband" too! Lemme interject from the male point of view here :) I absolutely *hate* relationships where there's ever a need to "lay down the law" or dictate every little thing my partner can (or can't) do (or have the same dictated to me). It's a *partnership*, not a master/slave relationship. Independence is a must -- yes, we will tackle most of our combined challenges together, but if I'm ever incapacitated or unavailable my partner needs to be able to make intelligent decisions on her own (and even be able to speak for me or on my behalf, with authority and confidence), because my very life may well end up in her hands in a situation like that. It's great to set guidelines and to have mutual agreement on them. I want her to be independent, yes, but I absolutely relish the feeling that someone out there wants to run home and hug me first thing when she walks in the door because she misses being around me :) I get that way too. well, letting your spouse independent happens only where theres is a great understanding between them. if understading is there, no dictates will be there. this is my experience with my wife. we rarely shout at each other.